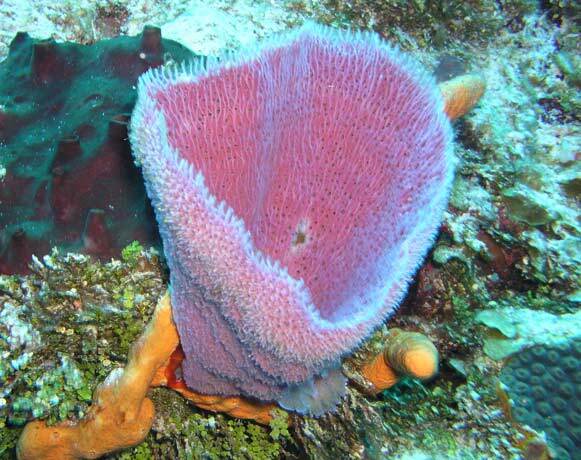 The Azure vase sponge is a species of sponge known by the scientific name Callyspongia plicifera . Its skeletal structure is a complicated system of sponge fibers. The outside is very bumpy but the inside is very smooth. The sponge reproduces both sexually and asexually. Sexually mixes an egg with a sperm which then flies away and becomes a new sponge where it lands. Asexually is where a piece of sponge breaks off and grows into a new sponge. Its lifespan can range from a few months to 20 years. The maximum size is 18 inches tall. It also lives no more then 18 meters below sea level. It is used by people for decoration and is being studied to be used for medicine. Animals can use it for protection. Color: It is known as the world's most colorful sponge. It can come in blue, purple, or pink and is also shaped like a vase.